1 LIVING / DINING ROOM with TV CD player Fireplace, overlooking a covered terrace with dining area + dominating views of the surroundings and the pool. 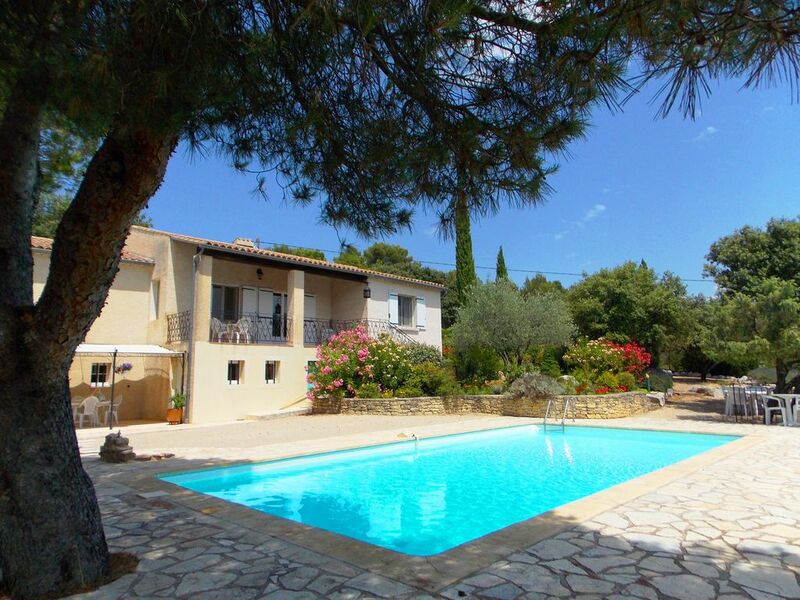 - 1 BIG BEDROOM with bed 160 x 200 + view on the Mont Ventoux, the gardens and the swimming pool. - FINAL CLEANING of 120 € or 130 € (with animal) to be paid on arrival in the accommodation. Villa located 1 kilometer from the village with shops: Grocery, Bakery Bar Restaurants Post office ..
A place of greenery and calm ideally located for the practice of different activities. as well as Drome Provençale .. CAR AND MOTORCYCLE: The Nesque, the Gabelle, Le Plateau de Sault, Mont Ventoux, Col of Peroneal .. The opportunity to discover the charm of Provence, its history and its villages. Côtes du Rhône, Châteauneuf du Pape, Gigondas, Vaqueyras, Sablet, Rasteau, Ventoux, Beaumes de Venise ..